There is one bingo site that likes to make waves. Bingo Waves makes a big splash for players surfing for a new online bingo experience. Catch the wave, the surf is up and let the high sea lead you to Bingo Waves. Geared up in a hardhat and a red surf board that reads “bingo” is a little round ball of a man with a beady black eyes and a grin. No, it’s not an alien; it’s the bingo wave catcher welcoming visitors of the shore of Bingo Waves. You can’t miss the huge star studded billboard banner advertising the biggest jackpot of them all, the Million Dollar Coverall. The homepage offers up all kinds of big jackpots that will have players slipping and sliding straight to registration. Bingo Waves is powered by Dragonfish software, one of the king tunas of the bingo sea and land world. In the online gaming market since 2007, the software made an impressive appearance and built a strong following of players. Come up from out of the water to dry land and feel the heat from the Hot Bingo games. Free Bingo, Daily Jackpots and £1M Jackpots are where it all begins, but hardly ends my bingo friends. 90 ball and 75 ball bingo are the featured variation complete with everything a bingo player would expect including Side Games and Chat Games. The bingo rooms are cheerful and have a nice pallet of colors for a joyful feeling every time you play. With all the essentials needed for happy chatter complete with smileys and a chat host who will keep it warm and friendly. Play Slots and the Super Slots with more paylines and bigger cash prizes. For those who have a streak of poker fun in them there is a Video Poker machine and for Table action Blackjack and Roulette. Instant Games are offered with a fairly large selection and compliment the gaming suite. 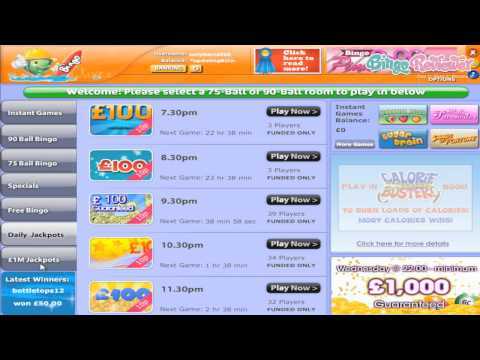 The Bingo Promotions are bigger than a tidal wave full of all kinds of offers. After joining indulge yourself in a bit of free play with a No Deposit Bonus compliments of Bingo Wave. Your first deposit will be enhanced by a Deposit Bonus to maximize gaming pleasure. Happy Hour takes place every Monday between 4-6pm where players can double Loyalty Points. Check the schedule for £100 Guaranteed Jackpot games. The Free-4-All is free bingo over £200 given away every day, every month. Team Bingo is a fun interactive game where top teams compete for prizes. Earn Loyalty Points for every card purchased, friend referred and in Chat Games. The Loyalty Program has 3 levels of VIP and offer exclusives, extra bonuses and greater rewards. A big wave pulled in a treasure chest of promotions that are endless. Variations on different types of bingo games are a welcoming invitation to join. We rate Bingo Wave with 4 Pink Hearts. This site starts you off with a pretty decent welcome offer. They give you £10 free, with no deposit required. It didn’t last me too long but it still allowed me to get a feel for the games offered at the site and which ones would become my favorites. I wasn’t too crazy about the layout here. I found it to be a little plain. I realize the layout doesn’t necessarily have a direct relation to how their games will be… although sometimes it does. I just think they could stand to do a bit of remodeling to make their homepage stand out a little more and draw people in upon first glance. They offer only two types of bingo here: 75 and 90 ball. It would have been nice to see at least one more. One thing I did really, really enjoy about the site was the promotions and their million dollar coverall jackpot giveaways! This site is interesting, and even though it looks really simple (and maybe a bit too simple if you ask me), it works real fast, is easy to navigate and they did organize all the important info just as it should be, accessible and understandable. What better way to get started then a completely free £10 no deposit bonus. There are also the regular depositing bonuses, weekly bonuses and some progressive jackpots. I did recognized some of the promotions, and no wonder since it is a Dragonfish site, and I can say only the best for the games and promotions. I presumed they offer 75 and 90 ball games, and I was right. It would be nice that they had a popular 5 line bingo as well, but this will be just fine, specially because there are a more than a few other instant games as well. You can’t go wrong with bingo waves! They have a whole lot to offer including a decent welcome bonus of £10 to get you started. The last thing you’ll be thinking about is their welcome bonus once you get a taste of what they have to offer here. I was happy with their selection of bingo, which consists of 75 and 90 ball. Their jackpots are amazing and what I love the most are the free bingo options. They have it available every single day to both funded and non-funded players. There is serious cash to be won every single day when it comes to free bingo at bingo waves. They have tons of other exciting promotions to engage in as well. For example, they have a very nice happy hour bonus which is definitely worth taking advantage of. All you have to do is deposit during their magical hours and you can receive bonuses.